Hundreds of thousands of people attended World Youth Day 2008 [WYD08] in Sydney. Pilgrims from over 170 nations attended the week-long event (15-20th July) culminating in one of the largest mass gatherings in Australia. St John Ambulance Australia was the primary health care agency chosen for the provision of health services to WYD08 participants and officials. WYD08 posed a number of challenges during the planning and deployment stages of operational activities; due to the extremely large number of participants and varying location of WYD08 events. 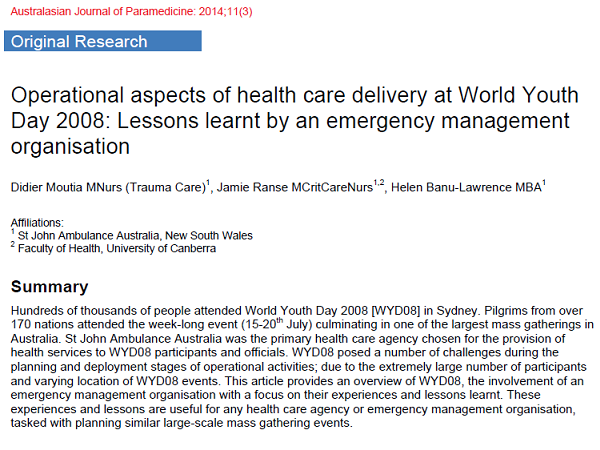 This article provides an overview of WYD08, the involvement of an emergency management organisation with a focus on their experiences and lessons learnt. These experiences and lessons are useful for any health care agency or emergency management organisation, tasked with planning similar large-scale mass gathering events.